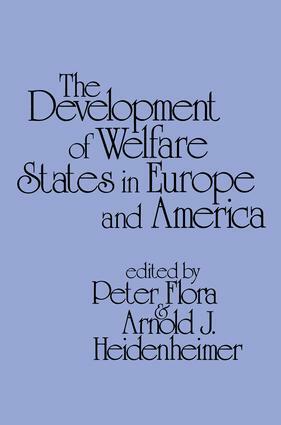 This volume seeks to contribute to an interdisci-plinary, comparative, and historical study of Western welfare states. It attempts to link their historical dynamics and contemporary problems in an international perspective. Building on collaboration between European-and American-based research groups, the editors have coordinated contributions by economists, political scientists, sociologists, and historians. The developments they analyze cover a time span from the initiation of modern national social policies at the end of the nineteenth century to the present. The experiences of all the presently existing Western European systems except Spain and Por-tugal are systematically encompassed, with com-parisons developed selectively with the experi-ences of the United States and Canada. The devel-opment of the social security systems, of public expenditures!and taxation, of public education and educational opportunities, and of income inequal-ity are described, compared, and analyzed for varying groupings of the Western European and North American nations. problems of the welfare states who seek to gain a comparative perspective and historical under-standing. A second group may be more interested in the theory and empirical analysis of long-term societal developments. In this context, the growth of the welfare states ranges as a major departure, along with the development of national states and capitalist economies. The welfare state is interpreted as a general phenomenon of modernization, as a product of the increasing differentiation and the growing size of societies on the one hand, and of processes of social and political mobilization on the other. It is an important element of the structural convergence of modern societies — by its mere weight in all countries — and at the same time a source of divergence by the variations within its institutional structure.